When our brief-but-glorious strawberry season hits, I try to make the most of it. As luck would have it, we were recently asked to bring a dessert to a barbeque, and I was on my first crate of berries. After a drool-filled Pinterest session, I came away with a winning recipe for Cheesecake Sugar Cookie Cups from Like Mother Like Daughter. I put a bit of my own spin on it, so that’s what I’d like to share with you today. Combine the butter and sugars. Mix well. Add the egg and vanilla and mix well again. Add the flour, cream of tartar and baking soda all at once and mix until combined. Preheat oven to 350 degrees. Grease a mini muffin tin. Using a small scoop (mine is equal to two teaspoons of dough), press a scoopful of dough into a circle and drop it into a muffin cavity. Using the tips of your fingers, press the dough evenly up the sides and into the bottom. If you find the dough is too soft and is sticking to your fingers, pop it in the fridge for about 10 minutes and try again. Bake for about 10 minutes, or until the edges are lightly browned. 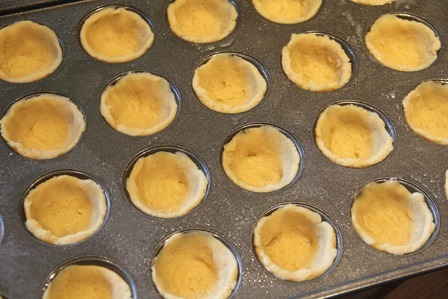 Remove the pan from the oven and immediately press the centers down and the sides in using something rounded. I found the bottom of a large coffee scoop worked well. Let them cool for a couple of minutes, then remove from the pan to a wire rack. I pressed my finger lightly on the inside, then slid the cookie up until I could grab the top edge to pull it out. Refrigerate the bowl you’ll be using for at least 15 minutes before beginning. Combine the cream and sugar in the bowl and whip until stiff. I used my mixer, and it took a few minutes. Set the bowl in the fridge. On a side note, I ended up with a larger container of whipping cream than I needed, so I wondered if it could be frozen to use later. I tried it, and while it worked, it wouldn’t get as fluffy as the original, no matter how long I whipped it. Of course, that didn’t stop us from eating that batch too. Beat the cream cheese, sugar and vanilla together until smooth. Fold in all of the whipped cream. Cut one corner off a Ziploc bag and fill about halfway with cheesecake filling (or use a pastry bag). Fill each cookie by squeezing the bag. Top with one small or half of a large sliced strawberry. This makes 48. If you like sweetness as much as I do, try these with this Strawberry Shortcake Sangria recipe from Lemon Tree Dwelling. 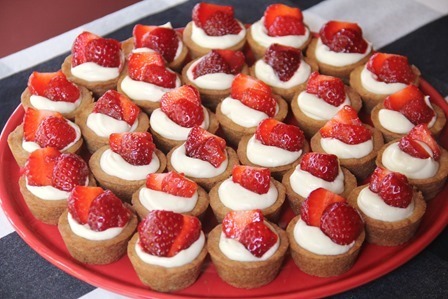 Strawberry heaven!